Oceans have a large capacity to absorb CO2, thus reducing the amount of CO2in the atmosphere and bringing carbon atoms into the ocean system. Many CO2 molecules that diffuse into sea surface waters diffuse back to the atmosphere on very short time scales. However, some of the carbon atoms from these original CO2 molecules stay in the ocean for time scales of hundreds to thousands of years. If some carbon atoms eventually make it to the bottom of the ocean sediment, they can be stored for time scales of millions of years. How does carbon get into the ocean and what happens to it once there? How does the ocean carbon cycle compare with the terrestrial carbon cycle? How does carbon get transported down to deep ocean sediments? Which organisms are involved? Let's begin by looking at the detailed illustration of the ocean carbon cycle on the right. Click to enlarge. Although quite complex, you will see carbon cycle processes and biosphere components similiar to those you learned about when you studied the terrestrial carbon cycle in prior Labs. Take a few moments to familiarize yourself with the ocean carbon cycle illustration and answer the questions below. What processes do you see that are the same in the terrestrial carbon cycle? 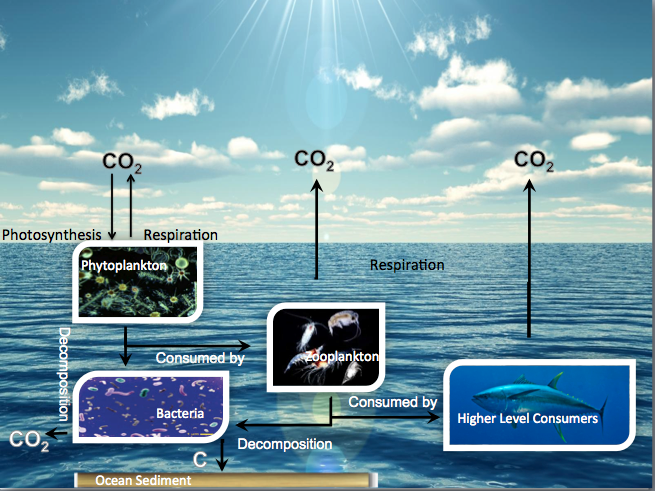 What organism brings CO2 into ocean carbon cycle? By what process? What types of small organisms also found in the terrestrial carbon cycle appear to play a key role in the ocean carbon cycle? 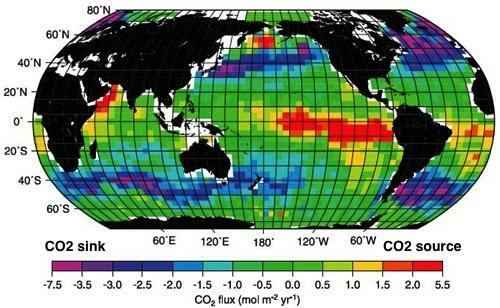 Molecules of CO2 enter the ocean by diffusing into the sea surface waters and dissolvinga physio-chemical process. The amount of CO2 that diffuses and dissolves in the sea surface water depends on variables such as wind, sea surface mixing, concentrations of CO2, and the temperature of the water. Take a few minutes to closely examine the image below. This image represents the movement (flux) of CO2 into and out of the sea surface of the ocean. Purple to blue colors indicate areas of the ocean where more CO2 is diffusing into sea surface water than is diffusing from sea surface water out to the atmosphere. Thus, these areas are acting as a carbon sink. Green colors indicate that the movement of CO2 into and out of the ocean is fairly equal. Yellow to red colors indicate areas of the ocean where more more CO2 is diffusing out to the atmosphere than is diffusing into sea surface water. Thus, this area is acting as a carbon source to the atmosphere. Then, answer the Checking In questions. Which general areas of the oceans have low amounts of CO2 diffusing into sea surface waters? Choose all that apply. Parts of the ocean that behave as strong carbon sinks are: Choose all that apply. True or False. Check the statements below that are true. More CO2 diffuses and dissolves in colder sea surface water and less CO2 diffuses and dissolves in warmer water. Sea surface waters have become slightly warmer as the climate warms. If this continues, you would expect concentrations of CO2 in the atmosphere to decrease. Downwelling occurs when surface waters converge (come together), pushing the surface water downwards; regions of low primary productivity because nutrients get used up and are not continuously resupplied by the cold, nutrient-rich water from below the surface. currents occur in areas where cold, denser water sinks. These downwelling currents bring dissolved CO2 down to the deep ocean. Once there, the CO2 moves into slow-moving deep ocean currents staying there for hundreds of years. Eventually, these deep ocean currents return to the surface in a process called upwelling. Upwelling currents occur when surface waters diverge (move apart), enabling upward movement of water; bring water to the surface that is enriched with nutrients important for primary productivity (phytoplankton growth) that in turn supports richly productive marine ecosystems.. Many upwelling currents occur along coastlines. When upwelling currents bring deep, cold ocean water to the surface, the water warms and some of the dissolved CO2 is released back to the atmosphere. Downwelling and upwelling currents are important components of the deep ocean conveyor belt and are important in physcially transporting carbon compounds to different parts of the oceans. Watch the NASA video below that animates ocean currents. As you watch the video, visualize carbon compounds moving along with these currents. Next, examine the image below of the "Ocean's Conveyor Belt of Deep Ocean and Surface Currents." Look for areas where currents are sinking and rising. Re-examine the Ocean CO2 flux map and compare it to the Deep Ocean Conveyor Belt Map in the image above. What patterns if any, do you see that are the same in both maps. Explain how a CO2 molecule that diffuses into the ocean in the North Atlantic ocean could eventually diffuse into the atmosphere off the eastern coast of Africa hundreds of years later. 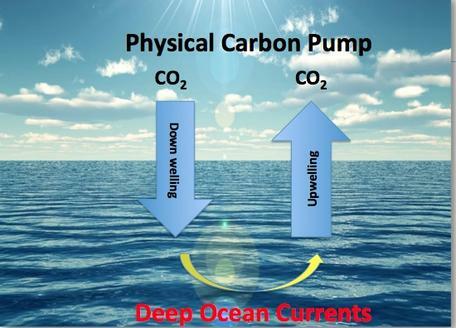 1: Describe the physical pump's role in enabling the ocean to be a carbon sink. Phytoplanktonmostly microscopic, unicellular photosynthetic organisms that live in the upper sunlit layers of oceans and other bodies of water; mainly unicellular algae but also includes cyanobacteria. (Greek for drifting plants)are microscopic, one-celled organisms that drift in the sunlit surface areas of the world's oceans and are key to bringing carbon down into the ocean biological pump from the atmosphere via the process of photosynthesis. Just like land plants, phytoplankton use chlorophyll and other photosynthetic pigments to capture Sun's energy for photosynthesis. Using light energy from the Sun, carbon dioxide, and important ocean nutrients such as nitrogen, phosphorus, iron and vitamin B, they convert the carbon dioxide and water into sugars and other carbon compounds. These carbon compounds enter the marine food web and some carbon eventually ends up in deep ocean currents and seafloor sediments. Phytoplankton return CO2 and O2 to the atmosphere when they respire. Over 50% of the world's oxygen needed by us to breathe is produced by phytoplankton. Look at the simplified image of the oceanic biological carbon pump above right. Draw a carbon pathway that moves carbon compounds between the two reservoirs (ocean and atmosphere)in the shortest timescale. Draw a carbon pathway that would move carbon atoms from the atmosphere to a place where they would be stored for millions of years. Once in the food web, important food web processes such as feeding, producing waste products, dying and decomposing move carbon down into the twilight and deep zones in the ocean. When plankton and larger marine organisms eat, defecate, die and decompose, they produce sinking carbon-containing particles called marine snow. Getting carbon into the ocean is one mattergetting it down to the deep ocean is another! About 50 Gt (50 billion metric tons) of carbon is drawn down into the biological pump per year but only a small fraction of this carbon makes its way down into the deep ocean. (2007 IPCC Report). What happens to the carbon as it moves down through the biological pump? What is the role of the "microbial loop" in moving that carbon? 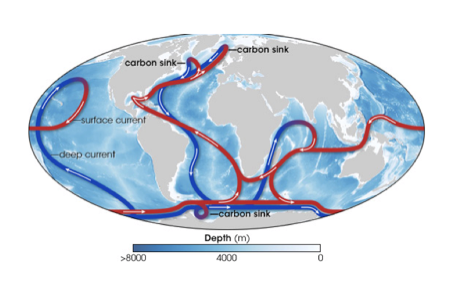 How much carbon actually makes it down to the deep ocean and why is this important? To answer these questions, you will use the interactive below developed by Woods Hole Oceanographic Institute(WHOI) and then watch a video on the ocean's microbial loop. Begin by clicking on the Plankton Key and Particle Key in the upper right hand corner. Familiarize yourself with the information in these two keys. the role of microbes and the microbial loop in reducing the amount of carbon that eventually makes its way down to the bottom of the ocean. As the carbon moves down through the biological pump, less and less carbon actually makes it down into the deep ocean. How do microbes and zooplankton reduce the amount of carbon that eventually sinks to the ocean bottom? Why are particles such as marine snow so important in bringing carbon down into the twilight and deep ocean zones? The ocean naturally contains many dissolved chemicals which are especially important to the ocean carbon cycle and the shell-building organisms that live in the oceans. The ocean carbonate system is linked to the biological pump and plays a very big role in transporting carbon down to deep ocean sediments where it is stored for very long time scales of millions of years. 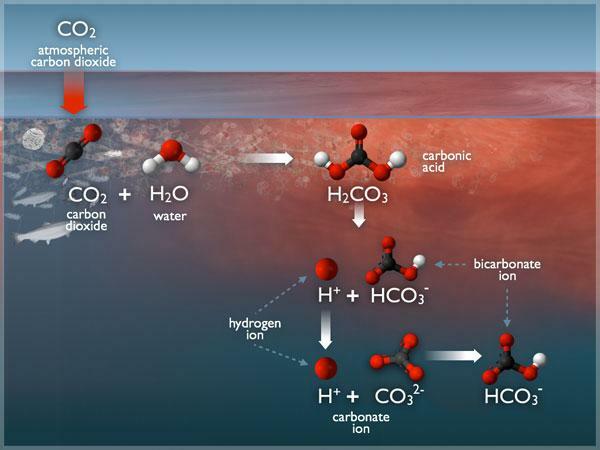 When CO2 dissolves in the ocean, it combines with water molecules and then enters into a series of reversible chemical reactions that produce bicarbonate ions(H+CO3-), hydrogen ions (H+) and carbonate (CO32-) ions. The carbonate ions are especially important to marine organisms because they combine with calcium ions (Ca2+) to form calcium carbonate (CaCO3). Shell-building organisms such as coral, oysters, lobsters, pteropods, sea urchins, and some species of plankton use calcium carbonate to build their shells, plates and inner skeletons. Examine the image of the ocean carbonate system above right and then trace the pathway of carbon atoms from CO2 molecules to calcium carbonate (CaCO3) molecules. Now, take a big breath and then exhale. Describe how carbon atoms from the CO2you exhaled could end up in the shells of a shell-building organism such as a lobster or clam. Shell-builders use calcium carbonate molecules (CaCO3) to build their shells. Which of the following could be a source for the carbon atoms in the calcium carbonate (CaCO3) molecules? Choose all that apply. Provenance: Coccolithophore - Allison R Taylor (University of North Carolina Microscopy Facility) Micrograph of Foraminifera courtesy of Lynn M. Hansen, Great Valley Museum, Modeasto California. When shell-builders die and sink, the carbon in their shells is transported down to the deep ocean where the carbon can become part of deep ocean currents and seafloor sediments. Many shells dissolve before reaching the seafloor sediments, a process that releases CO2into deep ocean currents. 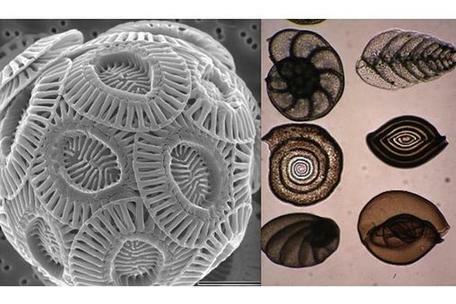 Shells that do not dissolve build up slowly on the sea floor forming calcium carbonate (CaCO3) sediments. Eventually, tectonic processes of high heat and pressure transform these sediments into limestone. This process locks massive amounts of carbon away for millions of years. Some of the smallest shell-builders transport the most carbon down to seafloor sediments. Microscopic shell-building unicelluar coccolithophores tiny unicellular marine phytoplankton that live in large numbers throughout the upper layers of the ocean; build outer plates (shells) of limestone calcium carbonate(CaCO3) and foraminifera mostly microscopic, unicellular amoeboid protists that live in the ocean; produce shells of organic material, sediment grains, or calcium carbonate; can be found in just about every marine environment from the deep sea to shallow reefs, buried in sediment or floating in the water column. reproduce quickly when nutrients are available. When nutrients have been used up, trillions of these tiny shell-builders die and sink, bringing carbon down to the deep. The White Cliffs of Dover on the coast of England pictured in the image on the right are a famous example of limestone calcium carbonate sediments that were deep under the ocean millions of years ago. Over very long time scales, tectonic forces have pushed these sediments above water. If you examined a sample of sediments from these cliffs, you would find shells of microscopic coccolithophores and foraminifera that lived, died and then sank to the sea floor millions of years ago. Over time, these sediment layers such as the White Cliffs of Dover eventually return carbon to the oceans by weathering and erosion. Name all of the places in the ocean that you would find carbon. Choose all that apply. The amount of CO2 in the atmosphere would increase/decrease. The amount of carbon moving down to be stored in deep ocean sediments would increase/decrease. Explain why you chose your answers. 3. Choose two of the following and describe their role in the ocean's biological pump. 4. How are marine phytoplankton and forests similar in their role in the carbon cycle? 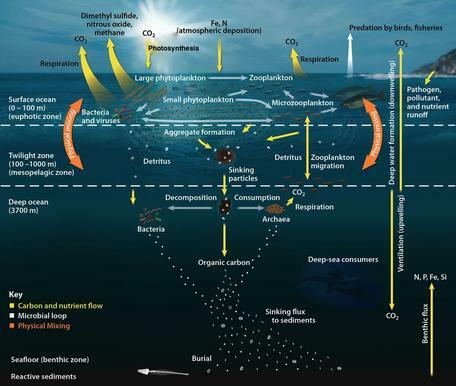 Want to learn more about the oceanic carbon cycle? Check out these resources. Watch this TED talk video: Why You Should Care about whale poo!